Men and women of any age can benefit in many ways from taking karate. Adults and teens who are looking for a way to improve their health, fitness, strength and flexibility, and reduce stress, can meet and exceed their goals at East Valley Martial Arts. Classes are focused on building strength in body and mind, agility, flexibility, endurance, and confidence through the life protection arts. 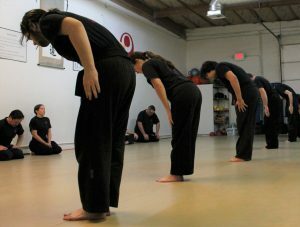 Our style of Ryukyu Kempo is a unique life protection art which teaches straight forward practical self-defense techniques as well as advanced martial arts skill. It is beneficial for all ages from teens to young adults to seniors. It's for anyone who would like to improve their life along with a positive, supportive group of instructors and other students. Karate is a great activity for adults of all ages as you take it at your own pace. In classes, you compete with yourself and have fun while staying in shape. The youngest students in our adult program are 13 years old, and there is no maximum age. All programs include our full curriculum with practical self defense, light-contact sparring, kata and more. Call now to learn more about our Adult Karate Classes!